Green house cleaning franchise Better Life Maids adds the Chevy Volt to its fleet of green house cleaning vehicles. The Chevy Volt is the new standard of green driving, and provides many advantages in fuel economy, technology, and operating costs. 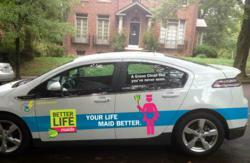 Better Life Maids is adding the Chevy Volt to its lineup of green house cleaning vehicles. Better Life Maids St. Louis clients are beginning to see the Better Life Maids Chevy Volt arrive at their homes. Green house cleaning franchise Better Life Maids has purchased its first of two Chevy Volt electrified vehicles for 2012, with plans to add three more to its St. Louis green house cleaning fleet in 2013. "The Chevy Volt is the perfect car for our fleet," said Matt Ricketts the President and Chief Experience Officer of Better Life Maids. "Our longest driving routes are less than 40 miles per day, with most under 25, so it is conceivable that we could go weeks or months between trips to the gas station." For the first three weeks that Better Life Maids has operated the Chevy Volt they have used less than 2 gallons of gas. With the Volts 9.3 gallon gas tank, that means a trip to the gas station once every 60 days. "With the reduced fuel costs and other factors considered, the Volt is actually less expensive for us to acquire and operate than all of our other fleet vehicles, including the Toyota Prius." Stated Ricketts. "We are looking forward to driving the Chevy Volt for many years to come. It is a big step in the right direction for automobiles. You have the low carbon footprint that we are looking for in a vehicle when it is in electric mode, but the backup generator is there to make sure we can serve our clients on time and without range anxiety. We can further reduce Better Life Maids environmental footprint, while driving a high tech, fun to drive, yet affordable electrified vehicle. We are really excited to have chosen the Volt"